Created this fun birthday card using this sketch from Viva La Verve. The sentiment is from Small Celebrations by Verve and it was stamped in Bahama Blue ink by Memento. The butterfly stamp is by The Purple Daisy which has been punched using an EK punch. The medallion behind the sentiment is Spellbinders Medallion One. I added the paper flowers from Recollections. The background paper is textured damask by Paper Studio. Viva La Verve offers a monthly challenge with 4 weeks of challenges to be completed by the end of the month. I'm going to try to do all of the challenges this month. (Crossing my fingers) I used the Treasured Words stamp by Verve stamped in brown. 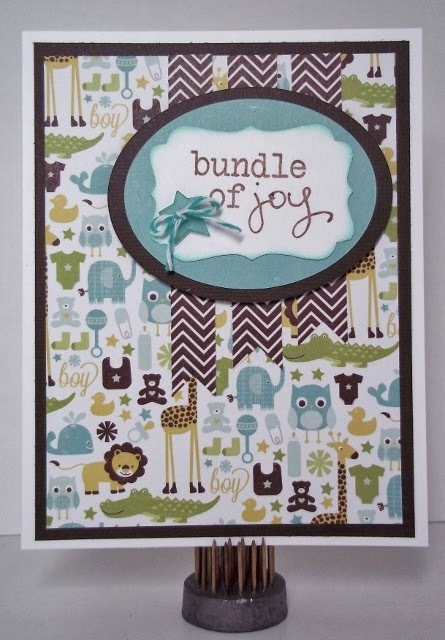 Echo Park's Bundle of Joy paper pack provided the perfect mix of green, brown, and aqua. This paper is so cute! 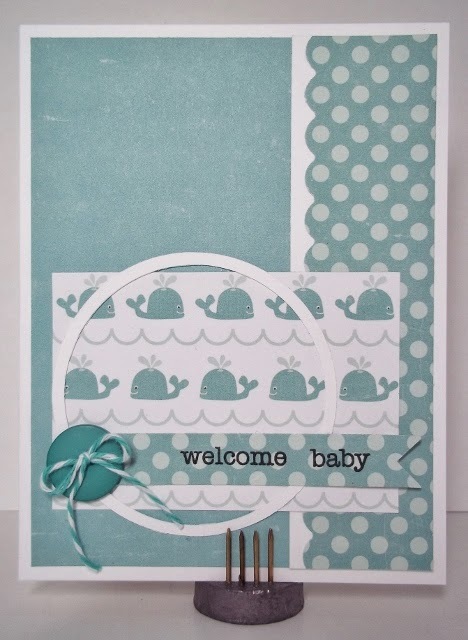 Using this week's My Favorite Things Wednesday Sketch Challenge, I created this monochromatic baby boy card. The papers are from Echo Park's Bundle of Joy paper pad. I used MFT's Bitty Banners for the sentiment. My daughter is getting married in May so we're planning to give her a bridal shower in a few weeks. 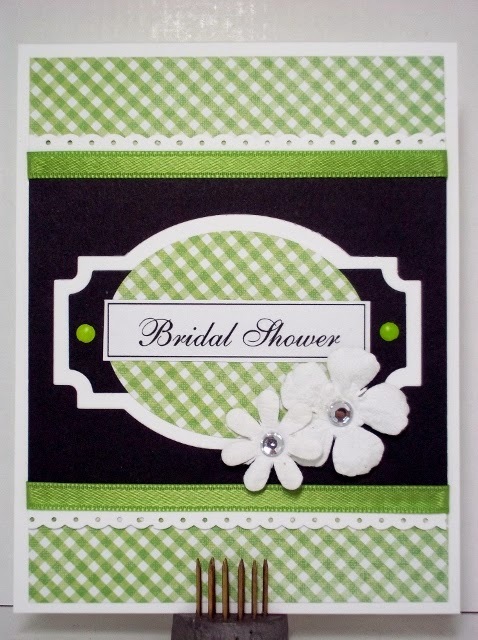 I thought this week's sketch at Mojo Monday combined with the inspiration challenge at The Pink Elephant (using my daughter's favorite color green) worked perfectly to create a clean & simple invitation to her shower. Now, I just have to make about 25 more of them before Saturday so the guests will know they are being invited. 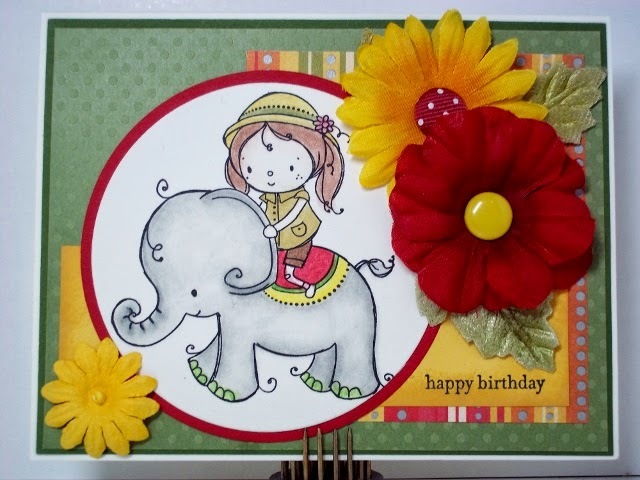 This is a Kraftin' Kimmie stamp from Dream Big that I won from a Kraftin' Kimmie challenge recently! She is so cute I couldn't wait to ink her up. I'm entering her in this week's Kraftin' Kimmie use your stash challenge. I was able to use quite a few things from my vast collection of supplies. The patterned paper is from We R Memory Keepers that I've had for at least 3 years (about time it was put to good use) The silk flowers were taken apart and added to my stash about the same time also. The color inspiration came from last week's Color Throwdown colors of lucky limeade, real red, and daffodil delight. The sketch is Sweet Sunday Sketch Challenge #210. The last few days I've been busy working on some cards but haven't had a chance to post them. Today I'm sharing a card I made with last week's Deconstructed Sketch. I didn't get it finished in time to enter it in that challenge. It does qualify for Kraftin' Kimmie's Wonderful Wednesday "anything goes" challenges. Majority of the papers are from Scenic Route which I've had in my collection for a very long time. 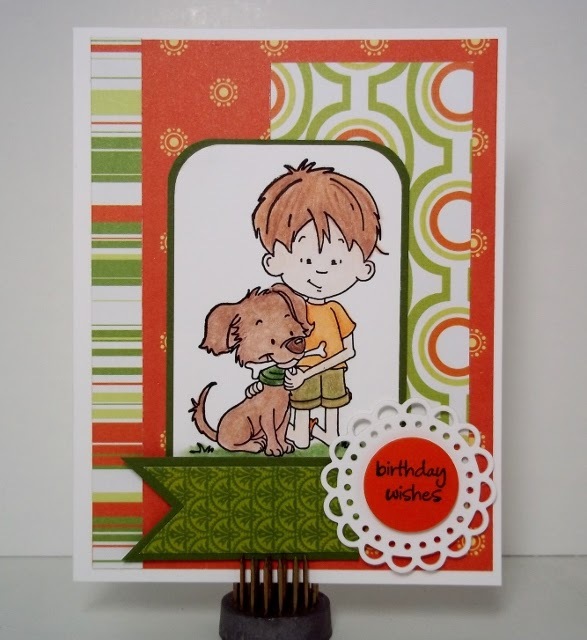 I combined them with one of the Best Fur-iends stamps by Kraftin' Kimmie to make a birthday card suitable for a boy. Love the bright colors! Today's card combines From the Heart Stamps sketch challenge with Paper Players challenge to create a spring thank you. I used some papers I've had in my collection for a very long time and have no idea the manufacturer but they are such spring-like colors I had to use them. 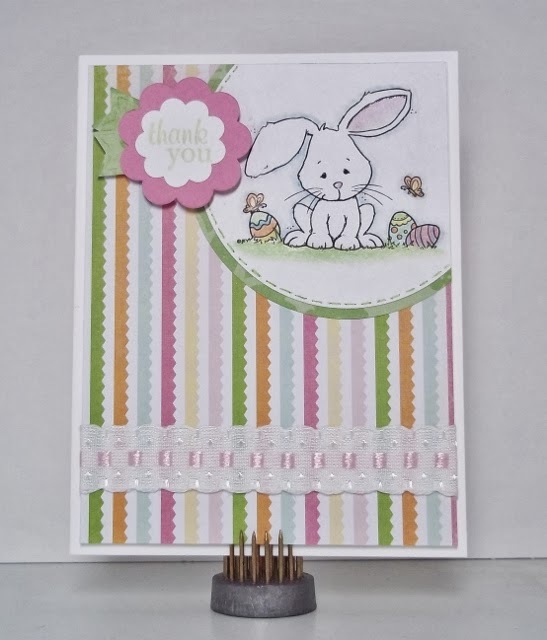 The easter bunny is a digital stamp from From the Heart Stamps. Isn't he adorable? Changed the sketch slightly since I don't normally make square cards. The image is colored with colored pencils. 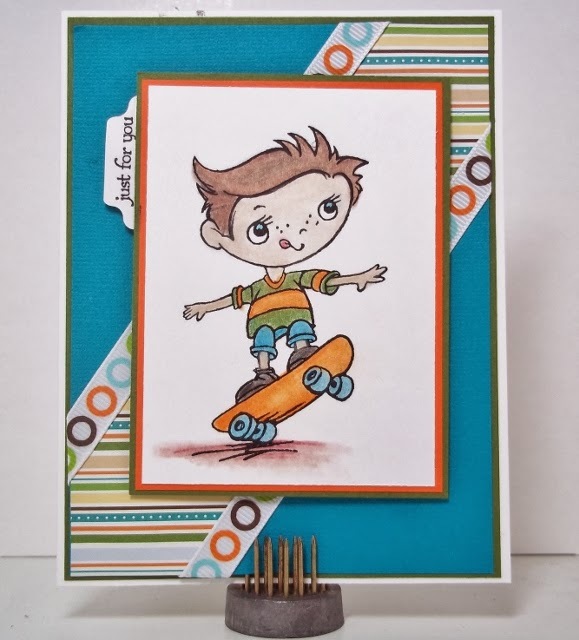 Just had to work with this fun stamp by Stampendous to make a fun boy card today with the Sketch at the Sweet Sunday Sketch Challenge. I used bright fun colors and added ribbon from American Crafts that I've had in my stash along the diagonal edges of the patterned paper from Reminisce. Working with teal, silver, and white on a christmas card was the challenge from Merry Monday #97. I punched snowflakes using various punches with pearly white cardstock, trimmed the edge with snowflake ribbon, and stamped the sentiment in silver. 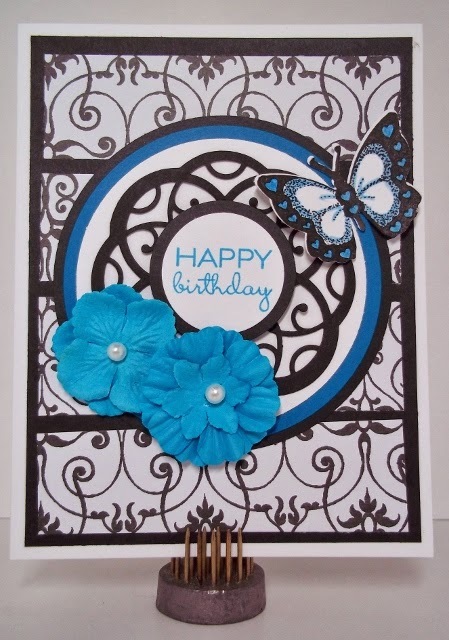 A border in teal finished the card nicely. The final touch was to add a little bling with rhinestones in the centers of 3 of the snowflakes. Kraftin' Kimmie 219 Challenge today was to use flowers so I worked with Lulu from Birthday Lulu set and papers from the Hey Girl 6x6 paper pad. I even added a dimensional flower with a pearl center to the waistband of her skirt. The sketch was MOJO Monday 334.